One of my favorite books is “The Gospel Blimp and Other Modern Parables”. It is by Joseph Bayly and has a lot of great stories that challenge our notion of our faith. A number of these stories are (HAPPILY!!!) available online at http://www.ccel.us/howsilently.toc.html#Eleven One of these stories is Ceiling Zero. In this story some people are able to fly (without aircraft and without balloons). But as the story goes on, the focus shifts from the excitement of being able to fly and wanting to help others learn to fly, to studying Aerodynamic Theories, and questioning whether seeking to help people fly helps or hurts those who are bound to the ground. The story is meant to be a parable about salvation and evangelism. But to me it also is looking at Missions. -Developing syllabi for missions classes and “powerpoints” for seminars. But is this missions? I think it is to a certain extent… but there is a caveat. Utilizing ones talents and training to serve God is good; but there is the risk that one will simply drift into one’s comfort zone and refuse to leave. I used to go outside of my comfort zone a lot, back when I was running (with my wife) medical mission trips, and assisting in a churchplanting effort. But my forays into missions that directly interacts with people in need has been less in recent times. An additional concern is that missions strategy and theory becomes disconnected from reality. This seems to be common in missiology today. Missiology must be grounded in sound theology and social sciences… but must also be rooted in the real world (not just academia). I see myself at risk in this area. That is why I am looking to go outside of my normal comfort zone. I have been working on administration and training at our counseling center. I am now moving into doing regular (instead of occasional) counseling. This is somewhat scary for me. I much prefer to type than talk (especially one-on-one). But this is important. It is not to remove myself from the more normative work I do. Rather, it is to keep myself from losing my connection with reality… people in need. I keep changing my mind about how to define “missions”. I have heard good definitions and bad definitions. The one that I am leaning towards right now is as follows. I think that when missions gets too grounded in academia, the third part (compassion) becomes abstract. Additionally, missions begins to become less an act of worship (and the term “worship” becomes taken over by singers, shouters, and dancers). Academic missions becomes mostly limited to “faithfulness”. But what is it that we are faithful to? Is it God? God’s Mission? Or our vocation? I don’t have all this worked out in my head yet. That’s okay. It’s a lifetime pursuit with God. I think we all need Self-Reflection. And I think we need honest appraisals from friends. Being successful in what one is doing does not mean that one doesn’t have important blindspots that must be addressed. There has been a lot of concerns about Christian missions and its role in RELIEF and in DEVELOPMENT. Much of this is in the area of perception. Here is some variety with regard to perspective regarding these forms of social ministry. a) Spiritualist. Spiritualistic ministries (evangelizing, discipling, church-planting, etc.) are the only God-ordained ministries. Other ministries distract. b) Social Gospel. Doing good, socially, IS doing Christian mission. d) Ulterior Motive. Social ministry opens the door for Spiritual ministry (which is the “real” ministry work of missionaries). e) Wholistic (or holistic). Ministry is concern for the whole person in their social setting. Therefore, ministry must be holistic… social and spiritual. The people I tend to work with tend to be either “Ulterior Motive” or “Wholistic”. The problem with the perspective of ulterior motive is that it devalues the person (don’t really care about the person so much as “saving souls”). Additionally, it tempts one to do “bait and switch”. On the other hand, Jesus did social ministry because of compassion (holistic) and as a sign (ulterior motive). So saying what is the absolutely correct perspective is not cut and dry. 2. Perspectives of social ministry in the social sciences. Social ministry can seem like a no-win situation. Relief work can be perceived as charitable or paternalistic. Development can be viewed as transformational or as culturally imperialistic. The good news is that you simply can’t please everyone so you don’t have to. However, it is good to listen to both supporters and detractors. Relief can drift from an edifying work to a destructive work. The same can be true of development. 3. Perspectives of development and relief (from their own proponents). The biggest detractors of Christian relief tends to be from Christian community developers. To developers, relief disempowers, demotivates, and creates dependence. Of course, people doing Christian relief can point out problems in development. Development has a high failure rate, and is too slow to deal with immediate problems. Focusing on the third perspective area, I (as usual) prefer a Both/And idea rather than an Either/Or. 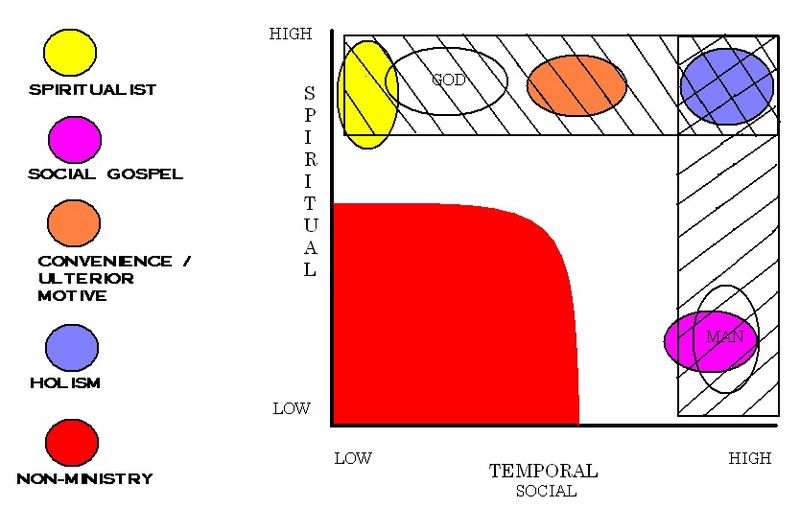 The diagram above is the “Double Vortice Model” that was part of my dissertation on medical missions. It suggests that when outsiders come in, they have the resources and skills. Thus, initially, health ministry in a community is focused more on relief (although partnership and collaboration with local individuals and groups is still essential). One can see that as the right vortex being dominant… outsiders coming in, partnering with locals, carrying out wholistic ministry, and going away, with the possibility of repeating the cycle as necessary. 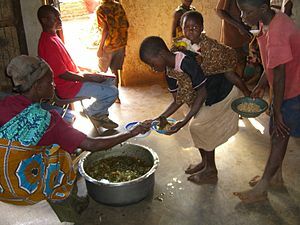 However, locals have the cultural knowledge and the long-term presence, so to move from “healthy” relief to “healthy” development, there must be skills and resource transfer to the local population so that the left vortex will eventually dominate (with limited continuation of the relief cycle since there is no society on earth that is completely self-sufficient). An unhealthy situation is where there are no skills or resource transfer to the local population (or no partnership). Jesus fed the 5000 as a relief ministry of compassion. This demonstrated His concern for their immediate short-term needs. That was good. But if he fed them every day… what was a wonderful expression of love and a sign of the Kingdom of God, would become damaging. This would create dependency and diminish local capacity to deal with problems. On the other hand, a complete absence of outside support lives in denial of our own interdependence. We are stronger as we share, learn, and grow with and through each other. Dependence is not the ideal, but neither is Independence. We all need Interdependence. Great quick article on the “Worst-Paying College Degrees of 2011” from Monster.com. These numbers were based on things in the USA. But I doubt things elsewhere drift too far from this. It is pretty clear from this list that caring for the young and the needy does not pay well in society. This includes Religious Studies and Theology. Of course, maybe that is the way it should be. There have been times when “going into religion” was considered a good way to make a living… even if the person was not dedicated to serve God and his fellow man. Maybe, if the sacrificial nature of service was removed from these jobs, they would be corrupted. Maybe it is good that missionaries commonly struggle to survive. Perhaps if missions paid well… something valuable would be lost in the process. I don’t know. I certainly got paid a lot better when I was a military officer and when I was a mechanical engineer than I get now (but I truly have no reason to complain). I still think it is a shame that our society rewards behavior and jobs that (sometimes) are self-serving and unnecessary, over ones that (I think, at least) are critical. I know the term “missional” is a bit… faddish. But an obvious value in it is that it breaks away from the excess baggage attached some other terms such as “missions” and “missionary”. When we talk about missions, we start talking about strategies, and contextualization, and organizations. When we talk about missionaries, we start talking about calling, support, and methods. Maybe “missional living” is a way around the morass. Decide for yourself. Look at the article below… and the other articles on this blog. We rely on the parables of Jesus… and in many ways, rightly so. As God’s Word, and the words of our Savior and example, the 50 some parables of Christ should provide a foundation from which much of our Christian thought and practice is built off of . But that does not mean that the parables of Jesus set the limits on our use of analogy, simile, metaphor in expresses ethical and spiritual thought. As we reach out to a secularized (and sometimes hostile) world, we need to learn to express great truths that challenge the norm, in the form of stories that appear (at first to be) harmless. Often the best stories to do this are children’s stories. Children’s stories seem harmless, so they are often accepted with less skepticism. Additionally, a good children’s story can teach many different ages. They may be effective with a simple moral for children, but have deeper relevance as one gets older. Often the best stories are “secular” stories. We expect Christian stories to preach to us. People are less likely to presume that a story without a Christian tagline may hit us where it hurts. Here are a couple of my favorite secular children’s parables. 1. “The Giving Tree“, by Shel Silverstein, Harper and Row. This is familiar to many people. It was first published in 1964, and is still around. For a child, it expresses selfless love. This same message applies to adults. However, the message may even be stronger for adults who have greater experience with selfishness and love with conditions. Adults can compare the actions of “the boy” with that of the tree, and with their own actions and relationships. The story can be taken further to consider sacrificial love in terms of Jesus. 2. 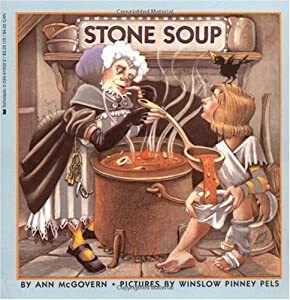 Stone Soup. This is an old folktale, that was the basis of a book by Marcia Brown in 1945. It is one of my favorites. For children, it can simply be a funny story about the values of generosity and teamwork. For adults it can go further. -I have used this in missions fund-raising to demonstrate that God can do great things with what is little and seemingly useless. Once again, the idea of generosity and teamwork is included. -The challenging concept of “catalyst” can be shown in two ways. First in terms of the traveler, and second in terms of the stones placed in the soup. If you have other examples… why don’t you add them here???? One of the problems of not getting a real liberal arts education (most of my education is in Mechanical Engineering and military leadership), is limitations in communication and the arts. One of these is in the role of parables. When I was young going to church, parables were defined as “earthly stories with a heavenly meaning”. This is a nice and (obviously) memorable definition. However, what really defines a heavenly meaning? Is an ethical story a parable? Later, I learned a parable as being “an extended simile”. This is a way of contrasting it with an allegory, which is an “extended metaphor”. The obvious problem with that meaning is that it is disconnected from its purpose. 1. The first power of the parable is that it engenders change. It is suppose to challenge our preconceptions and beliefs, and point us in a new direction… a new orientation. 2. The second power of the parable is that it is memorable. Years ago I worked for Northrop-Grumman. I remember that during the first week we were in orientation class, the VP of Engineering told us a parable. It is pretty much the only thing I remember from orientation. This is the story. Back in the 1800s were two small companies that made buggy whips… Smith Brothers and Jones Brothers. The vision statement of Smiths Brothers was “We seek to make the best buggy whips in the world.” Jones Brothers had a vision statement “We provide navigational control solutions to the world.” The first vision statement makes a lot of sense, but the second one is rather strange… correct? 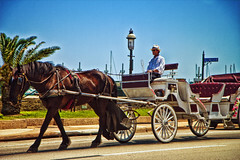 However, back in the 1890s the horseless carriage (automobile) was perfected and that began the demise of the horse-drawn buggy. What happened? The Smith Brothers company kept growing, for awhile, gaining market share in the buggy whip market. The Jones Brothers market share of the buggy whip market kept shrinking. BUT… this was because Jones Brothers began developing steering and control devices for automobiles. So over time Smith’s Brothers became the dominant company in a dying market, while Jones’ Brothers moved into strong niches in automobile, boat, and eventually airline navigation and controls. The lesson is that our vision limits our behavior. To grow in a changing world requires flexibility, and flexibility requires broad vision. While this may not be a “heavenly” parable, I have found it useful in both business and Christian missions. 3. The third power of parables is that it attracts interest. Having attended seminary in Asia, I have been told many times that the Eastern mindset is built around stories. This is supposed to be in contrast to the Western mindset that is propositional. However, I have some doubts in this. While it is true that Western preachers and theologians tend to be propositional, and have a fascination for the Pauline Epistles over much of the rest of the Bible, I don’t think this is true on a broader level in Western Society. People will pay good money to watch a movie or buy a comic book, but can hardly be talked into attending a public lecture or debate. Consider the origin story of Spiderman. It begins with a young somewhat self-serving college nerd, and ends with a man of power and responsibility. In fact, the story is really a parable that teaches the lesson “Where there is great power, there is great responsibility.” This lesson contrasts the normal human response that says great power means the ability to accomplish self-gratification. This story is hugely valuable as a comic book and developed into a hugely popular movie. The story is now part of the shared cultural experience in much of the world. It is not surprising that Jesus used parables. They engender change, they are memorable, and they attract interest. In missions, they should be developed and used. I probably should look at more forums, blogs, and such more than I do. However, did come across a nice forum thread on the issues regarding missionary support and church support (and control?) of missions. It has numerous perspectives… all of which are worth thinking about.